The Niagara River drains Lake Erie into Lake Ontario, on its way it has a vertical drop of more than 165 feet (50 m) this is known as the Niagara Falls, here seen from Skylon Tower, left: Bridal Veil (USA) and on the right side Horseshoe Falls (partly in Canada). Destination Canada, the second largest country in the world occupies most of the northern part of North America, covering the vast land area from the United States in south to the Arctic Circle in the north. It is a country of enormous distances and rich natural resources. Long time part of colonial North America, Canada became a self-governing colony in the mid 19th century (1867) while retaining ties to the British crown. Canada is bordered by Alaska (USA) in west, and by 12 US states of the continental United States in south, the country shares maritime borders with Greenland (an autonomous territory of Denmark) and Saint Pierre and Miquelon, an island which belongs to France. 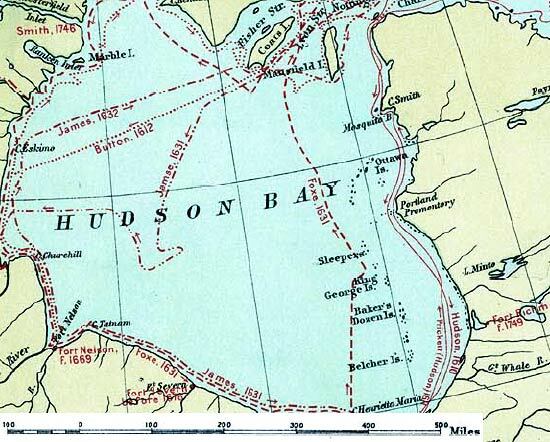 Hudson Bay, the large shallow inland sea indenting east-central Canada. Canada's landscape offers a wide range of natural sceneries and is divided into multiple geographical regions. The Canadian Shield, which is the largest geographical area, encompasses half the country and centers on Hudson Bay. The southeastern region of Canada is dominated by lowlands, bordered by the Great Lakes: Lake Michigan, Lake Superior, Lake Erie, and Lake Ontario. The country occupies an area of 9,984,670 km², making it the largest country in the Western Hemisphere. Compared it is slightly larger than the US, or 18 times the size of France. 36.3 million people (in 2017) live in the country, this is about 10% of the population of neighboring USA. 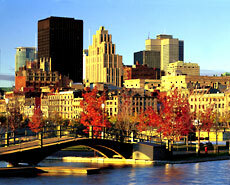 Capital city is Ottawa, largest city is Toronto, spoken languages are English and French. The vast land in Northern North America is rich of natural resources, home to 41 national parks and hundreds of provincial parks, Canada is a natural playground! The United Nations ranked Canada one of the best country in the world in which to live. Canada is globally recognized for its outstanding quality of life, stable, progressive political environment and one of the healthiest economies in the world. Economically and technologically the nation has developed in parallel with the US, its neighbor to the south across an unfortified border. 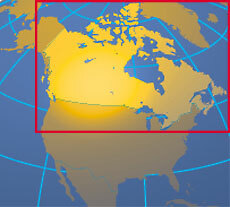 Map of Canada's time zone anomalies. Type: Confederation with parliamentary democracy. Independence:1 July 1867 (from the UK). Location: Northern North America, bordering the North Atlantic Ocean on the east, North Pacific Ocean on the west, and the Arctic Ocean on the north. Area: 9.9 million km² (3.8 million sq. mi. ); second-largest country in the world. Terrain: as vast as the country is, it offers many different landscapes, mountains, prairies, deserts, artic tundra, glaciers, valleys, foothills, rivers and lakes. Climate: Varies from temperate in south to subarctic and arctic in north. Ethnic groups: British descent (28%), French descent (23%), Italian descent (3%), aboriginal peoples (2%), plus significant minorities of German, Ukrainian, Dutch, Greek, Polish and Chinese. 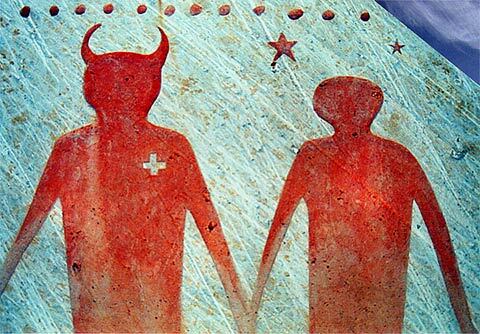 Religions: Religion: Catholic (45%), Protestant (36%) and minorities from most of the world's major religions. Languages: English 59.3% (official), French 23.2% (official), and 53 native languages. Literacy: 97-99% of population aged 15 and over. Natural resources: Iron ore, nickel, zinc, copper, gold, lead, molybdenum, potash, silver, fish, timber, wildlife, coal, petroleum, natural gas, hydropower. Agriculture products: Wheat, barley, oilseed, tobacco, fruits, vegetables; dairy products; forest products; fish. Industries: Transportation equipment, chemicals, processed and unprocessed minerals, food products; wood and paper products; fish products, petroleum and natural gas. 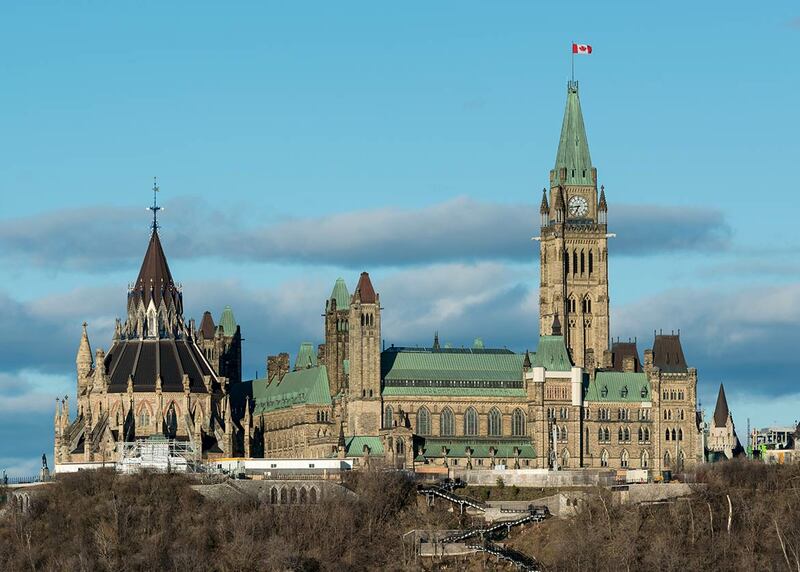 View of the Centre Block and the Peace Tower, the main building of the Canadian parliament (right) and the Library of Parliament (left) on Parliament Hill in Ottawa, Ontario. 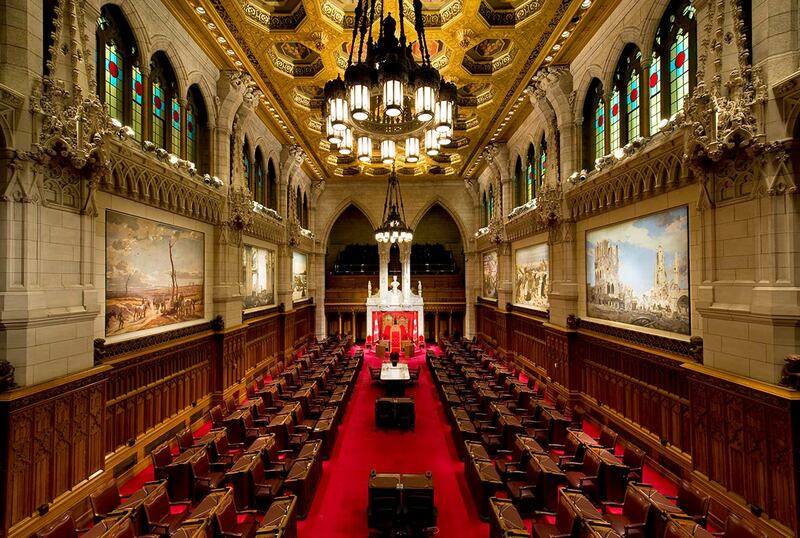 Canada's political system is a federal parliamentary representative democracy with a formal constitutional monarchy. Chief of State is the British monarch (Queen Elizabeth II) represented by the Governor General, who is appointed by the monarch. Theoretically, the executive power lies with the monarch, but in practice, the monarch and his representative are apolitical and predominantly perform ceremonial functions. Head of Government is the Canadian Prime Minister (Justin Trudeau). 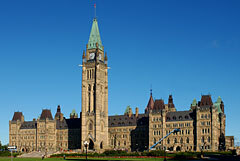 The Parliament of Canada consists of three parts, the sovereign, represented by the Governor-General of Canada, the Senate (Upper House), and the House of Commons. The Official Canada Government Site. Represents The Queen (Queen Elizabeth II) who is the Head of State. Index of Government of Canada Departments, Agencies, Crown Corporations, Special Operating Agencies and various affiliated organizations. Information about Canada's Permanent Mission to the UN. Embassy of Canada in Washington. Address List of Canadian Diplomatic Missions Abnroad. Address List of Foreign Diplomatic Missions accredited to Canada. Links to government services, information and resources, for citizens of other countries. provincial boundaries, provincial capitals, major cities, and major airports. Searchable map and satellite view of Canada. Searchable map and satellite view of Canada's capital city. Searchable map and satellite view of Calgary City. Searchable map and satellite view of Canada's second largest city. Searchable map and satellite view of Quebec City. Searchable map and satellite view of Canada's largest city. Searchable map and satellite view of Canada's third largest city. Reference Map of North America. Interactive political map of Canada. Interactive relief map of Canada. Canada à la carte - various theme maps by the Canadian Geographic Magazine. Depicts the locations, types and magnitudes of significant natural disasters that have affected Canada. Clickable maps to Canada's topography. Interactive and authoritative source of over 350 000 official and formerly official geographical names in Canada. Canada's Senate chamber in the Centre Block on Parliament Hill, in center the three thrones, for the Canadian monarch, the consort of the monarch, and the Speaker of the Senate. With "The Ultimate Guide to (Canadian) Newspapers". Canada's national news and photo wire. from Canada and around the world. Science, news, music & more. Listen to CBC Radio, Canada's National Broadcaster. Current news from Canada and the world. Canadas Voice to the World. Canadian related portal with news. Canada.com is owned and operated by Postmedia Network Inc., Canada’s largest publisher by circulation of paid English-language daily newspapers. Haie, an immersive installation by Sébastien Bilodeau from Architecturama, invites passers-by to walk through a labyrinth of six luminous panels. The eighth largest art museum in North America presents 1000 years of extraordinary art. Paintings, sculptures, drawings and prints by First Nations, Inuit and contemporary Canadian artists. Contemporary Québec art and international contemporary art. Musée des Beaux-Arts du Canada. A guide to cultural events by CBC. The guide to alternative culture in Canada. Information about Canadian writers, novelists, poets, playwrights, essayists, Canadian literary organizations, magazines, publications, texts and library archives. National Library of Canada Home Page. Airplanes from the Pioneer Era until Post-1960. Virtual Museum of Canada's Civilization. More than a natural history museum. Objects and expressions of human creativity. Site of the Human Adventure. The human and natural history of British Columbia. The ROM will inspire wonder and build understanding of human cultures and the natural world. The permanent collection contains more than 10 000 textiles and spans almost 2 000 years and 190 world regions. History of the French exploration of North America. A Guide to Canadian Museums and Galleries and other cultural institutions. Canada is among the world's wealthiest nations, and is a member of the Organization for Economic Co-operation and Development (OECD) and the Group of Seven (G7). The backbone of Canada's economy is the service industry, which employs about three quarters of the country's workforce. Other major economic bases are the logging and oil industries, and the manufacturing sector with its automobile and aircraft industries. A federal Crown corporation wholly owned by the Government of Canada. Canadian multinational financial services company, the largest bank in Canada. The Montréal Stock Exchange (MX), owned by Toronto- based TMX Group. The Toronto Stock Exchange is in the Top10 of the world's largest stock exchanges. Government Services for Canadian Businesses. 'The Voice of Canadian Business'. Information on the Canadian economy, includes links to key Canadian economic indicators for the last ten years. A guide to Canadian Business and Industries, Company Directories, Consumer Information. 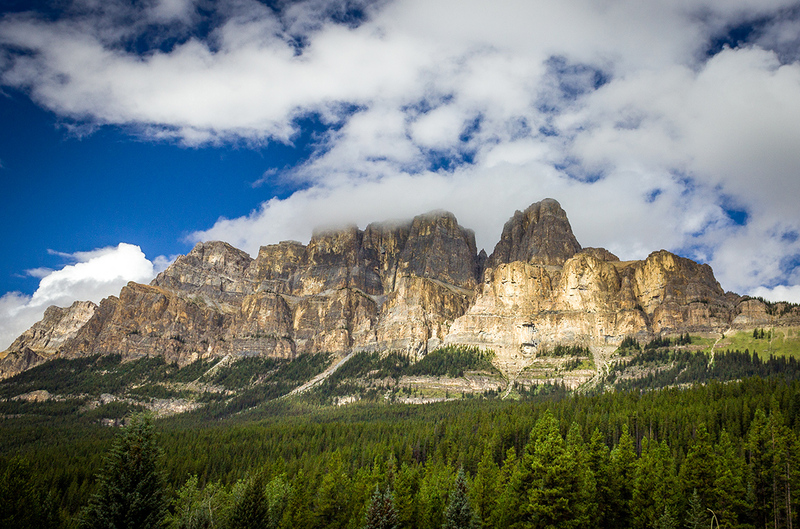 Castle Mountain within Banff National Park in the Canadian Rockies. hotels, accommodation, attractions, festivals, events, tourist boards, nature, biking, skiing, climbing, tours and much more. Canadian attractions, events and experiences. Extensive information on Canada for travelers, tourists and all who are interested in Canada. A comprehensive travel and tourism guide to Canada by the Canadian Tourism Commission. The official Business Site of the Canadian Tourism Commission. UNESCO World Heritage Site. In 1932 Waterton Lakes National Park (Alberta, Canada) was combined with the Glacier National Park (Montana, United States) to form the world's first International Peace Park. Explore Ontario, present, past and future, through historic photographs, maps, digitized books, videos, and blog posts. The Official Website of Canadas Capital. Online services for all sectors of the City of Ottawa. more links and travel information on Canada and its Provinces and Territories: the ten provinces and three territories: Alberta, British Columbia, Manitoba, New Brunswick, Newfoundland and Labrador, Northwest Territories, Nova Scotia, Nunavut, Ontario, Prince Edward Island, Quebec, Saskatchewan, and Yukon. A collection of Canadian and US related Social Research Links. Archaeological site on the northernmost tip of the island of Newfoundland. The remains of an 11th-century Viking settlement are evidence of the first European presence in North America. One of the world's oldest, largest, and best preserved buffalo jumps, a buffalo jump is a cliff formation which Native Americans historically used in order to hunt and kill plains bison. The only city in North American that has preserved its ramparts, together with its numerous bastions, gates and defensive works which still surround Old Québec. Up-to-date information on Canadian higher education. An Internet based network of Community Atlases that will be accessible to schools and the world. A partnership of universities across Canada, committed to delivering university-level programs that can be completed from anywhere in the country or beyond. HSSFC promotes teaching, research, and scholarship in the humanities and social sciences. Informational site on educational studies in Canada. Canada from space - plus a remote sensing tutorial. Société géographique royale du Canada. Canada's premier science and technology research organization. The national instrument for making strategic investments in Canada's capability in science and technology. Environment Canada's Internet resource for weather and environmental information. The Green Lane TM helps connect Canadians, exchange information and share knowledge for environmental decision-making. Official information site of Biodiversity in Canada. Site about biodiversity and especially Canada's biodiversity. A guide to Canadian National Historic Sites and National Parks. A great collection of photos of Canadian landscapes and landforms. Site of Nature Canada, one of Canada's leading conservation groups. Web site about Canada’s oceans and fish habitat by Fisheries and Oceans Canada. Created in the early 1960s to interest the public in wildlife conservation, now online. Government information about Energy Sources and Distribution, Mining, Forestry in Canada, and Climate Change. Online access to resources, services and the collection of the Library and Archives Canada. List of online resources about Canada's history by the Canadian Government. HCO is a browsable, searchable history textbook published by Northern Blue Publishing, with supporting resources, including image galleries and text libraries, timelines, quotations, learning activities and other features. A collection of historical Canadian pictures and photographs. Gateway to museums, galleries, and heritage information. The site provides a timeline and radio and television clips from the archives of the CBC about Canada's newer history. Wikipedia articles about Canada's history, covering the period from the arrival of Paleo-Indians thousands of years ago to the present day. Canadian The national representative organization of the First Nations in Canada. Government information about Canada's First Nations and aboriginal heritage. Foundation to preserve and revitalize the language, culture, arts, spirituality, and traditions of the Anishinaabe people. OWNO page about the First Nations of North America.